Garden Dice is a family strategy game that combines dice rolling, tile laying, and set collection. The game board depicts a garden as a 6x6 grid in which seed and vegetable tiles are placed using dice rolls as coordinates. 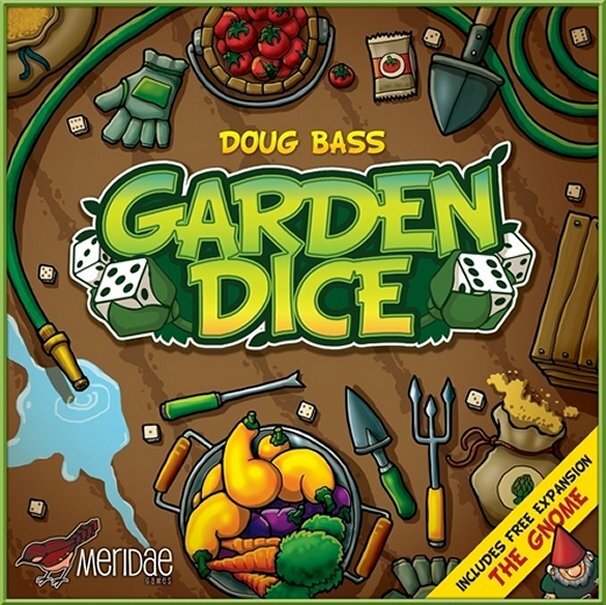 Players take turns using the dice to plant, water, and harvest five different types of vegetables with differing point values, from the lowly squash to the mighty eggplant. The game's chaining mechanism allows players to water or harvest multiple tiles using a single action, enabling players to build upon each others' chains. Players can also use bird and rabbit tiles to eat other players' seed and veggie tiles, but not without paying a small penalty. Two other special tiles – the sundial and the scarecrow – allow players to modify dice rolls or protect their own tiles. The Gnome expansion included in Garden Dice can be added to the base game to give players the ability to adjust the dice rolls for purchasing, watering, and harvesting their vegetables, leading to a more strategic experience. Bonuses increase the values of tiles as they are harvested, and additional points are awarded at the end of the game for collecting sets. The player with the most points when the last tile is taken wins.